Best friends who let me dress them in yellow and ruffles (What can I say it was 1982 and I liked Gunne Sax ~ before it was considered vintage). 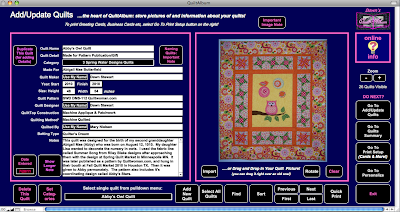 PS ~ Don't forget to leave a comment on my Previous Post and get in on the QuiltAlbum software Give Away! Deadline is Thursday morning! 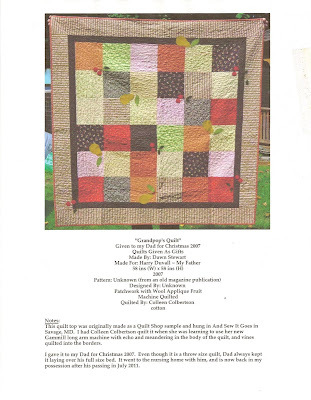 A Quilt Album Review & A Give Away! How many quilts have you made in your years of quilting? Any idea? What year did you make that favorite cuddle quilt? What kind of batting did you use in that baby quilt you gave as a gift to your niece three years ago? These are all typical of questions that I've asked myself in the past. Of course I've had good intentions to keep track of these things, but...well actually I've been so busy making quilts that I haven't much concerned myself with documenting them. And even though I know the importance of quilt labels, I have to admit I don't always get one made for every quilt. Well now along comes Quilt Album! I was introduced to Quilt Album software by Pat Sloan a few weeks ago. She asked me to try it, and give my opinions, and I have to say so far I'm loving it! 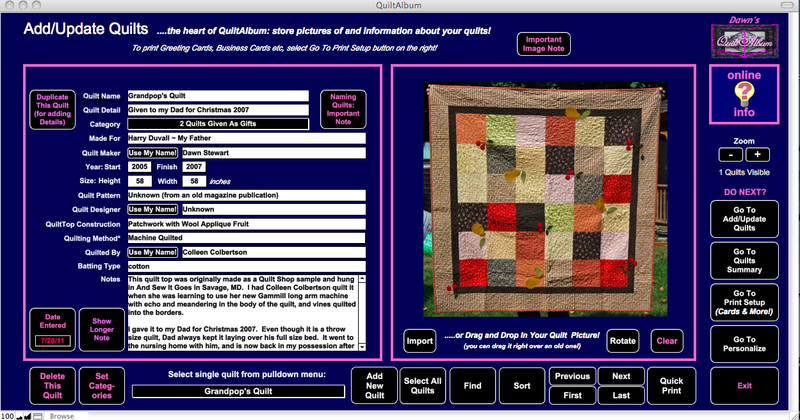 Quilt Album is a very user friendly computer program that allows you to fill in all the pertinent information onto a page for each quilt that you make. It keeps an electronic record of all of your quilts, and you can print out album pages to keep a scrapbook style notebook to flip through (something I've been intending to do ~ and well you know about good intentions....). 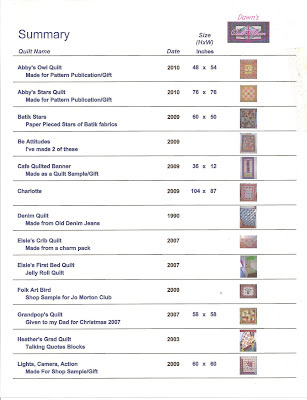 This is the screen shot of my Dad's quilt that I blogged about the other day in This Post. One of the things I like the most about this program is how easy it has been to download and use. They have kept it simple enough that it's been very easy to just jump in and get started even for a non-IT person like me :) Sometimes I find computer stuff so complicated that I don't have the time or the energy needed to learn it ~ I'm happy to say that's not so with Quilt Album! 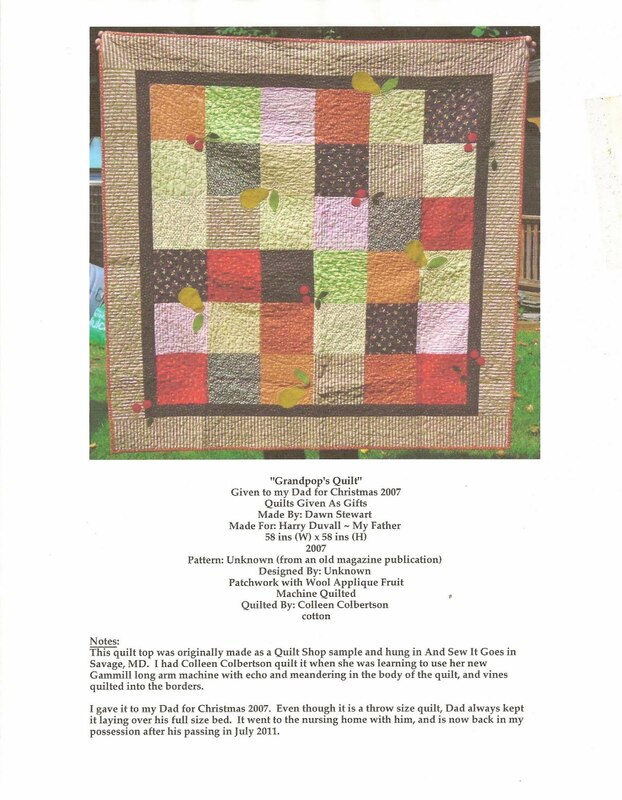 This is a scan (so it's a little faded) of the printed Album page for my Dad's quilt. I'm sliding them into page protectors and starting a notebook of my quilts. This page is full size, but you can also print out half size pages for smaller notebooks for easier carrying along like to guild meetings and such. The Quilt Album people have also thought of a summery page that you can print for your notebook that can serve like a table of contents. The summaries can be set up any way you like ie: alphabetically, by date, or category... Notice that I still have to go back and fill in some of my quilt sizes (I was adding some of them by memory, but can go back and follow up on the facts that I didn't know off the top of my head at any time, and just reprint the summary page). And remember those quilt labels that I'm so bad about! 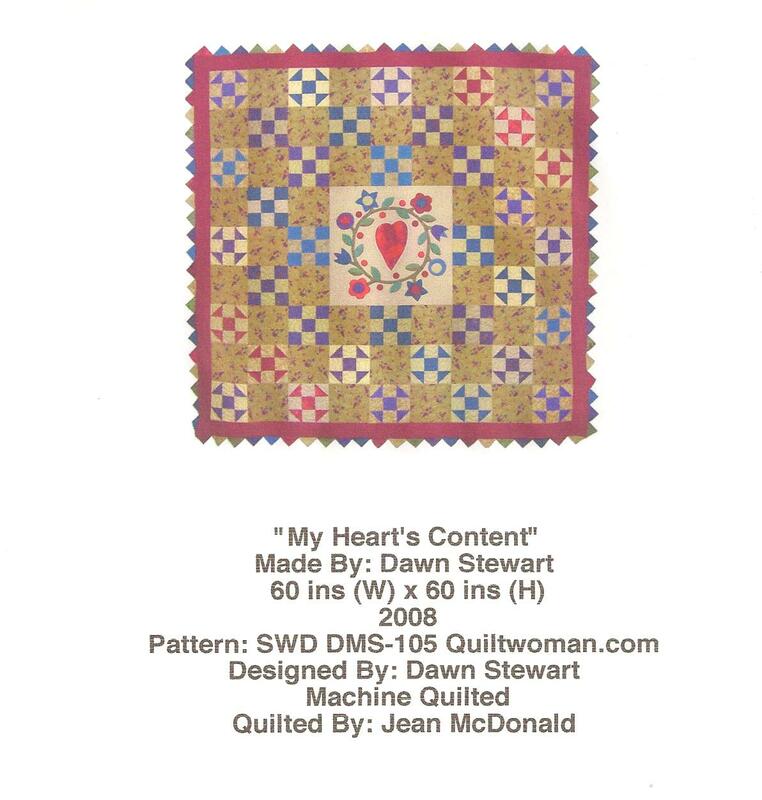 This is a sample of a quilt label that I printed out right from the quilt record in the software. In the print screen I can choose what information from the record I want to include or leave off of the label, and if I want a picture or not on the label. Then I can just print the label right onto printable fabric ~ This is going to make it so easy to go back and label some of my past quilts! In a matter of minutes I had note cards, business cards, and return address labels :) So cool! I've decided to work with Quilt Album as one of their Ambassadors, and of the most important things I like about this program is that it's also very affordable! 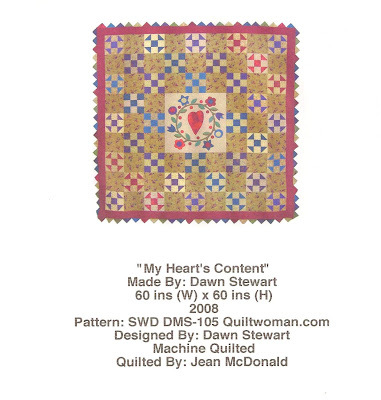 You can download a copy from Quilt Album for $29.95, (or purchase a disc for $39.95) and my readers can receive a $5.00 discount on your purchase if you enter the discount code of BCC-BG at the check out! 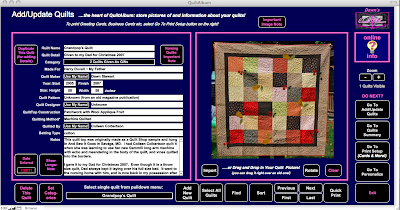 And Exciting News: The nice people at Quilt Album are offering a Give Away of a Free Quilt Album Software Program for one lucky reader of my blog this week! Just leave a comment on this post and let me know how you'd use Quilt Album. Become a follower of my blog (or let me know that you already are if you are) for an extra entry. I'll draw one name randomly on Thursday, August 4th at 6:00 am EST. Good Luck! I’ve often been asked why I quilt. It’s a legitimate question. After all, historically quilting was a utilitarian craft. People needed to make quilts to keep warm at night. Generally, resources were scarce so the small pieces from used fabrics were sewn together to make a larger piece of fabric to create a quilt.